when i read the book description, i was super excited to receive this book and start reading it. we often act as if God hides so well that signs of the divine presence are reserved for Hallelujah moments: burning bushes, transcendent music, sunsets, benign test results or rescue of one kind or another. 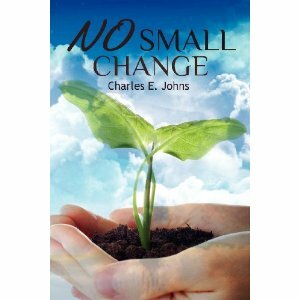 this book contains tales of people, places and things that can either pass unnoticed or can become elemental moments to change the way we experience God. each of the stories illustrates a way in which the ordinary can open the door to an engagement with the divine. No Small Change is an invitation to pay attention to the grace that envelops us, God’s persistent presence which longs to be embraced. when i read the first story, i was absolutely confused. as i read through the whole book, i was equally disappointed in the content. i thought the book was going to be a collection of stories involving other people and their encouraging experiences. but this book was a collection of hard-to-read short stories of only the authors experiences. it seemed like a collection of his stories, thoughts and life. i was expecting a book full of inspiration and encouragement. what i got instead was a book that couldn't hold my attention for more than a few minutes. while i do think there are some amazing points made in this positive book, they didn't really stick with me. if you want to read a book about a Methodist Preacher and his experiences, this book is recommended. but if you are looking for a book giving you encouraging experiences of different people about God (as i thought it was), this is not the book to read.